Lisa, like many of us, is fighting the good fight to help change the way we think of our food supply. By eating natural, organic, unprocessed and unrefined foods, we are taking a very important step towards affecting the change needed to ensure our health is protected, and that our children can thrive free of the modern day health issues which plague so many of us. So today I share a recipe that Lisa has allowed us to share – thanks Lisa! This is a simple substitution we can make to avoid using bread for our child’s sandwich. Instead, Lisa uses an apple in place of bread, and fills the sandwich with peanut butter (any nut butter would do here) and raisins. Other options are homemade chicken salad, or any organic carved lunch meats. Using toothpicks to hold it together is a smart trick and will make sure your child opens their lunch box and is greeted with a smart, healthy and delish meal. I hope it inspires you to make some small changes that will make a big impact on your, and your children’s health. 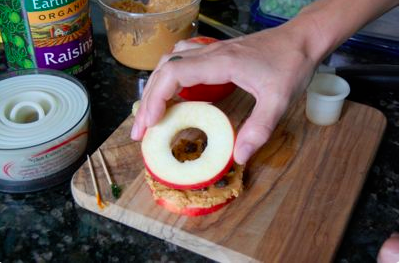 Follow this link to learn how to make an apple sandwich today! 1. Dip the apple in salt water before making the sandwich to prevent browning. « Get “Schooled” on Food Allergies with PTO Mom. Smart idea especially for kids who can’t eat breads. My son is gluten free but wasn’t able to eat any of the gluten free breads I could find in the store so I’m always trying to figure something else out for him. I hope he likes this. 2 Pings/Trackbacks for "How to: Make an apple sandwich (Grain free lunch options)"